Looking back at yesterday’s Georgetown post, I agree I was off in critiquing the student protest . But I think I did adequately characterize Rove’s strategy to create a 9/11-inspired defense of illegal presidential surveillance tactics. I saw this strategy as built on a daily sequence of stage-managed political events beginning with Rove’s RNC speech last Saturday and culminating with Bush’s dog-and-pony show at NSA headquarters yesterday afternoon. Judging from yesterday’s images, however, it appears the “frame” Rove had in mind was ahead of schedule. anti-bush. defeat cheney. defeat rumsfeld. pro-democrat. anti-bush. defeat cheney. defeat rumsfeld. pro-democrat. Rather than focusing on Bush’s sales pitch at top secret N.S.A. headquarters for his over-expansive spying program (link), the NYT instead chose the second picture above to define Bush’s day. 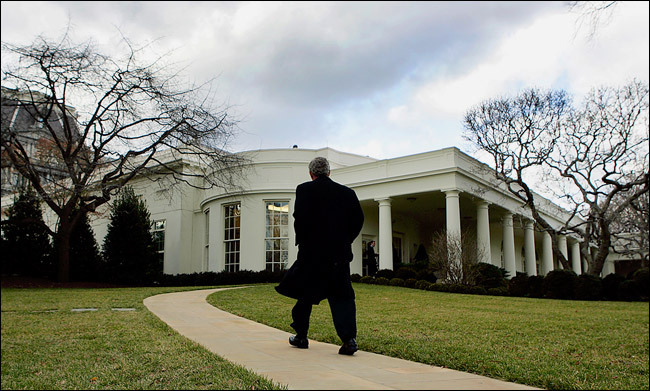 As if having already assimilated Rove’s propaganda, yesterday’s images seemed to credit Bush with a greater sense of mission as he shuttled around in the name of his unsanctioned national security antics. If one didn’t know better, it would be hard not to be impressed withe the power and authority conveyed in this newswire shot of the Presidential helicopter taking off yesterday morning for the N.S.A. Similar qualities are also conveyed in the NYT shot from the day’s end. Certainly, this is not the image of a man fighting to justify his exploitation of his office. Rather, Bush is presented as a romanticized figure; the singular leader who braves the path alone; a man who’s burns a candle into the night fighting the global enemy from the people’s house. Curiously, the most overt element in these book-end images is not Bush at all, so much as it is his residence. And congratulations to Karl for goading the media into using the building to help legitimize and enhance its otherwise law-revising occupant. (image 1: Jason Reed/Reuters. Washington January 25, 2006. Via YahooNews. image 2: Doug Mills/The New York Times. January 25th, 2005. Washington. nyt.com.) anti-bush. defeat cheney. defeat rumsfeld. pro-democrat.